A new Palm branded mobile device has been spotted in newly posted public FCC fillings. First spotted by the site, Android Police, the documents make numerous references to a Palm PVG100 model submitted by a company called the Palm Ventures Group, Inc. The Palm PVG100 could very likely be the first new Palm branded device to launch since the brand went into retirement following HP's decision to retire the Palm product line in 2011. Rumors have been circulating every few years that TCL, which acquired the branding rights to the Palm name back in 2015, is planning on releasing new hardware under the Palm brand on modern hardware. A further dig in the document list reveals some new details and hints about the potential relaunch of the Palm brand and new Palm devices in 2018. 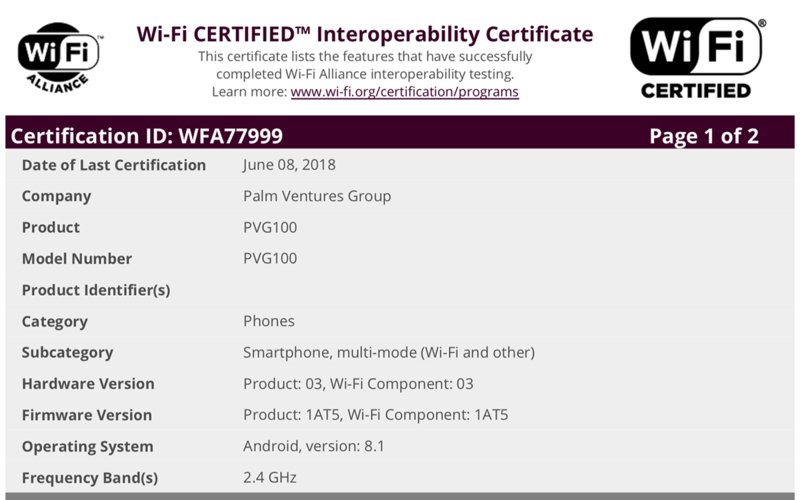 Also spotted are records for the Palm PVG100 in a related WiFi Certification document. This document also lists some additional details about the PVG100 mentioning that it is powered by Android version 8.1 and will support at least the 2.4GHz Wi-Fi band in b, g and n.
The FCC documents comprise of about 30 pdf files mostly covering various wireless test data and other regulatory compliance reports. The letter do reveal some new details about the company behind the Palm relaunch. First the company name is listed under the Palm Ventures Group, Inc. moniker. Palm Ventures Groups lists its cofounder as Dennis Miloseski. According to his personal bio, Mr. Miloseski is a former VP of Design and R&D for Samsung's Design America office and prior he also spent time as a Head of Design at Google. At Samsung his team worked on projects creating the Samsung Gear Fit 1 & 2, Gear S & S2, Gear IconX, Gear Circle, Samsung Galaxy View, and the Samsung Level Headphone Line-up. For more on Palm Ventures Group read our piece: Is Palm Ventures Group the new Palm? In a letter dated July 27, 2018 the Palm Venture Group cofounders ask the FCC for a short term confidentiality request for an initial period of 180 days. This request covers the public release of the external and internal photos of the device as well as test setup photos and the user manual. This request can easily be rented and extended but may provide some clue as to the release timeframe. Is Palm Ventures Group the new Palm? Is This the New Palm Logo? The following comments are owned by whoever posted them. PalmInfocenter is not responsible for them in any way. Please Login or register here to add your comments. Dust off the cobwebs, crank up the old forums, call up Pepper, kezza, abosco, LiveFaith, Gekko, hkklife, Legodude, Captain Hair, gfunkmagic, potter, Frenchie...we're getting the band back together! So tonight we gonna party like it's 1999! Anyway, if they make just a 'me too' Android phone with some Palm branding - they are DOA IMHO. However, they have track record with Blackberry brand & devices preserving the distinguishing feature - hardware keyboard. So one can hope they will have a Palm-branded device with a hw kbd too. Like a Pre / Pixi with Android. Or one can dream that they have both hardware keyboard and stylus. Like a Treo / Centro with Android. That will probably distinguish them much better, even with no cutting edge specifications. But we will probably keep dreaming …..
"Everyone has the right to have wrong opinion"
PalmInfocenter.com is not affiliated with or endorsed by Palm Inc. or HP. Any use of the word Palm is for discussion purposes and is a registered trademark of Palm Inc. Unauthorized use or reproduction of content is strictly forbidden.